Happy new Year Everybody!! Hope you had an amazing night and have a great new year! I had this incredible urge to make a Valkyrie feather headdress, so I did. 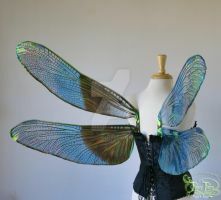 It is made with turkey feathers scales cut in different sizes and worbla. It's attached to a headband (I brushed my hair over it in this picture). I like this picture because it was made with a building lamp, you know, those lights they use at the building site XD ? #ghettophotography It worked though! Do you want something similar? Maybe in a different color or shape? Don't hesitate to contact me! I have to make a tiara with worbla for my upcoming cosplay and I know how much is hard to make a tiara with worbla without making everything melting down... So you're REALLY talented!!!  where did you find the feathers? Amazing! I love this! Unbelievable beauty! Tto amazing for words! Truly gifted. I'm so honored you will wear my headdress to your wedding! Thank you for your support and love! Feathers of the Valkyr, braided blond hair and looking towards the horizon - pure epicness of the valkyr! looks original! i want to see more! I would love to draw this photo if that's okay with you I'd link you to it so you could see and link it back to this photo so more people will see your awesome work! Yes, that's absolutely no problem like that. Thank you for asking! NP! I always like to ask since I have run into artist that have a problem even if you use part of an idea that they have done... so I don't like to upset people instead of what I'm trying to do which is complement them. WOW!!! that's a brilliant head piece!! It's absolutely beautiful! The fair women in the picture looks like a real goddess! >///< <3 She's incredibly lovely! aww, thank you so much for the nice comment! Your welcome dear!! I am happy to make you happy! Have a wonderful day! Cool design. It glows nicely into the braided hair. 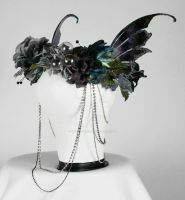 Carry me to Valhalla on your shoulder, please This headdress is so gorgeous! I really like how they sit out a little to the sides, and the scales are a very nice touch. Yes! So much yes! The coloring of the headdress as well as the model are utterly gorgeous and flow so naturally. The hair braids were a beautiful touch as well. love it. The wings must have taken a while and they look brilliant.